Even almost three years after winning the ‘My Best School Trip’ Award, Year 6 teacher Ian Wood said they’re still seeing the benefits of being involved. The PE coordinator at Kirk Ella St. Andrew’s C.P. School in Hull collected the award, and prize money at the ceremony back in 2016 – for a trip he had organised to YHA Eskdale in Cumbria. He has since urged other schools to get involved with the annual School Travel Awards and said: “The awards are a brilliant thing to be involved with. As the winners of the first ‘My Best School Trip’ award, we are still seeing the benefits of being involved, nearly three years on. “It has impacted on so many more areas than we had imagined. The way the children wrote about their experiences, and how they related to their learning in school was the first real positive we saw. For many, it really focused them on the purpose of their trip and made a lot of things make sense. Beth McKenzie, headteacher of Upland Primary School in Bexleyheath, won last year’s ‘My Best School Trip’ competition for a Year 5 trip to the Outward Bound Centre in Cumbria. The award was presented to her, and teacher Alex Langley, at the ceremony in November, by Ian Wood. Beth told STO: “We won £1,500 to put towards another trip which we have recently used to return back to our winning destination. The trip is so important for our students as they develop as individuals and as a team. The ‘My Best School Trip’ Award, open to teachers of Key Stages 1 to 4, is all about recognising educational visits that achieve their objectives and give children a rich and rewarding experience. You can visit our dedicated Award page to find out how to get involved. 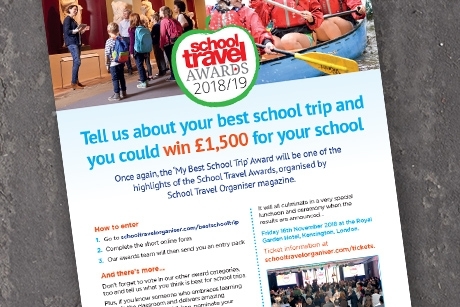 Fill in the form on the Award page to request an entry pack and we’ll send you everything you need to know about entering your school trip. Remember: The deadline for submitting your entries is 6th July. So, what are you waiting for? Enter now! You can also download and print off a poster to help promote the award.